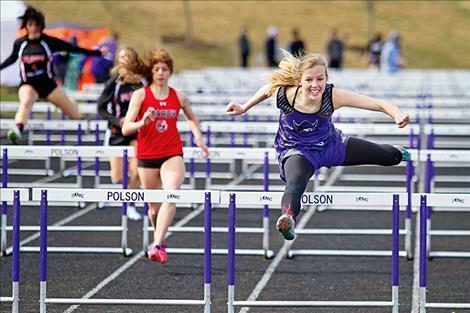 Charlo Viking Carlee Fryberger outruns everyone during the hurdles. Polson Lady Pirate Naima Crowl races down the back stretch of the 3200 during the Kalispell Mini-Invitational on April 10. Arlee Warrior Colt Crawford and Mission Bulldog Darius Redstar compete during the relay. 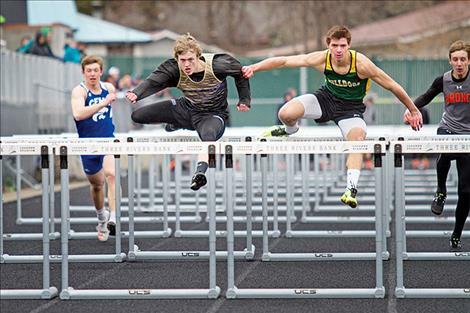 Polson Pirate Connor Lanier focuses on the last hurdle during the Kalispell Mini-Invitational on April 10. 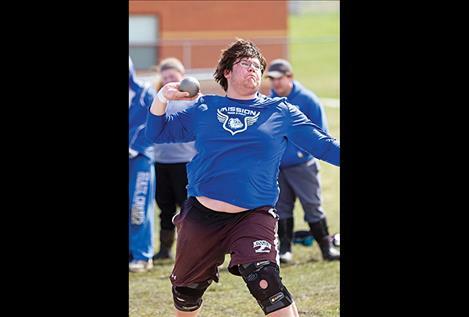 Mission Bulldog Michael Durglo prepares to launch the shot put. Montana High School Association (MHSA) made official last week at its annual meetings, the Arlee Warriors and Scarlets will be competing at the Class B level come 2019-20. However, the Warrior football team will remain 8-man football in Class C, since Arlee’s enrollment is still not large enough to reach the enrollment cutoff for Class C 8-man football. MHSA also decided that starting this fall, Billings and Butte will rotate as host of the state’s 8-man football championship. Football championship games have been contested at the higher seed’s home field across all classifications in Montana until now. The 8-man game will be the first classification to adopt a neutral site for its state championship game. 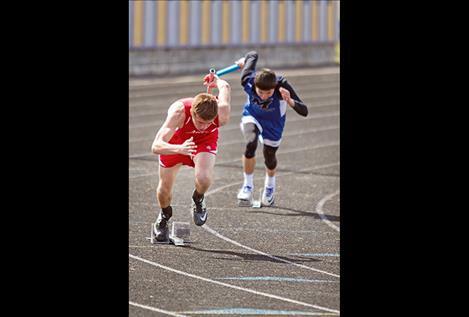 Bea Frissell, Naima Crowl, Quin Stewart and Connor Lanier were Polson track and field’s only top four finishers in their events Tuesday afternoon during the Kalispell Mini-Invitational at Legends Stadium. Frissell finished second (2:26.87) in the 800 meter and claimed third (5:30.79) in the 1,600, while teammate Crowl placed fourth (5:48.21) in the 1,600 and finished second in the 3,200 (12:16.44). For the boys, Stewart placed fourth (2:10.07) in the 800 meter and Lanier finished third in the triple jump with a jump of 39-05.50. The Charlo girls track and field squad finished seventh overall during the Florence/Darby Invitational at the Corvallis Community Events Center on Tuesday. Finishing in 16th as a team were the Mission boys, while the girls placed 18th and the Charlo boys finished 19th. Mission senior Michael Durglo took fourth place in the shot put with a throw of 45-02.50 and Afton Brander grabbed a third place (31-07.50) in the triple jump. The Charlo Lady Vikings took second in both the 4x100 and 4x400 relays. Tyrah Hammond placed fourth in the 100 meters (13.49), as did teammate Kira McPhail in the 400 meters (1:08.27). Charlo girls’ track and field captured the girls team title followed by Mission in second place and Arlee in 9th during the Dave Tripp Memorial in Polson on Friday. The Charlo boys placed second, Mission finished 5th and Arlee nabbed 12th place. Tyrah Hammond and Carlee Fryberger led the way for the Lady Vikings. 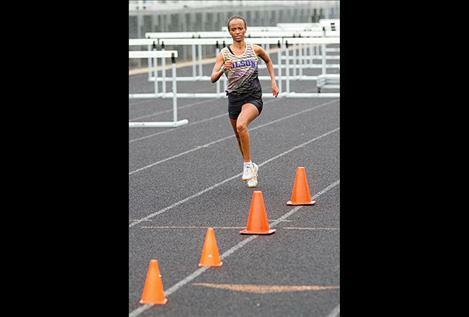 Hammond took wins in the 100-meter and 200-meter dash, Fryberger placed first in the 100-meter hurdles and both contributed to the winning 4x400 and 4x800 relay teams. Kaitlin Cox was a triple jump winner for the Lady Vikings with a jump of 34-00.75. Karolyna Buck took first in the long jump (4-10.00) and Sydney Brander out jumped everyone in the triple jump (15-09.50) for the Lady Bulldogs. On the boys’ side of the track, Charlo Viking Wills Degrandpre was a double event winner. Degrandpre won the 1600 with a time of 4:58.76 and the 3200 with a time of 11:04.94. Viking Landers Smith won the pole vault clearing 12 feet 6 inches. Michael Durglo won the shot put (43-11.50) for the Mission Bulldogs. 4x400 relay: Charlo (1, 4:30.78, Carlee Fryberger, Liev Smith, Destiny Manuel, Tyrah Hammond). 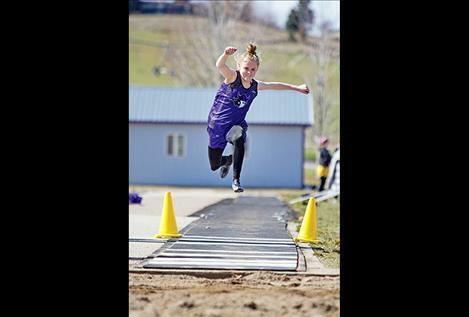 Track and Field teams from Polson and Ronan competed during the MCPS Invitational held at the Missoula County Stadium on Saturday. In the team standings, the Polson boys finished in 13th place, while the girls finished 17th. The boys team from Ronan placed 16th overall. Polson was led by a fourth-place finish from Colton Cote in the 110 hurdles (16.05 seconds) and a sixth-place finish by Trenton Adler in the 200-meter (24.13 seconds). For Ronan, James Normandeau was the top finisher with a fifth-place in the 800-meter (2:05.17). Hamilton overpowered the visiting Lady Pirates 20-1 in nonleague softball action on Tuesday, April 10. Kelsie Meis led the charge for Hamilton driving in eight runs on three hits. Hamilton limited the Lady Pirates to just two hits. Grace Quinones drove in the lone run for the Lady Pirates. Ronan picked up another home win this softball season with Tuesday night’s 13-3 victory over Corvallis. Marissa Mock drove in four runs on three hits for Maidens, while Shailee Courville and Jaylyn Hakes both had two RBIs apiece. Winning pitcher Gabby Wirz had three strike outs and gave up four hits. On Thursday, Stevensville held a 6-2 lead over visiting Ronan until the top of the seventh inning when the Maidens scored four runs sending the nonleague game into extra innings. The Maidens took the lead in the top half of the tenth inning on a Katlyn Santos double, which drove in two runs giving the Maidens an 8-6 advantage. Scoring two runs of their own in the bottom of the tenth, Stevensville tied the game at 8-8. Stevensville slipped a runner across the plate in the bottom of the 11th inning to take the 9-8 victory. Mission 3, Bigfork 2: In singles action in Bigfork on Friday, Laurenz Ehlers won 6-4, 6-7, 10-3; Lalo Bravo fell 6-2, 6-0; Riley Hutchins won 8-6 and Warren Castor won by forfeit. Castor and Bravo lost in doubles action 6-2, 6-2. Corvallis 5, Ronan 2: On the road, Garrett Anderson defeated his Corvallis opponent 7-6 (7-4), 6-4 and Thomas Yellow Bird won his match handily 6-2, 6-4 for the Chiefs’ only match wins on Tuesday. Loyola 4, Ronan 2; Valley Christian 4, Ronan 3: In Missoula on Thursday, the Chiefs narrowly lost their games in double header action. Coleman Taylor and doubles partner Garrett Anderson won both of their matchups defeating David Ramsey and Dan Kaleva of Loyola 6-2, 6-4 and Aidan McCloy and Caleb Colwell of Valley Christian 6-4,6-2. Whitefish 4, Polson 3; Polson 4, Cut Bank 2: The Pirates dropped the opening match of the Cut Bank Invitational to Whitefish 4-3 then rallied to defeat Cut Bank 4-2 on Friday. The event was moved to Polson due to adverse weather conditions in Cut Bank. Kaiden Forman-Webster won one singles and one doubles match for the Pirates. Bigfork 1, Mission 0: Pam Frost fell to her hosting Bigfork opponent in straight sets 6-0, 6-0 on Friday. Corvallis 4, Ronan 0: The Maidens where overpowered on the road falling 4-0 to Corvallis in singles and doubles action on Tuesday. Loyola 5, Ronan 0; Ronan 2, Valley Christian 1: In double header tennis action on Thursday in Missoula, the Maidens were swept in both singles and doubles play by Loyola. In the late afternoon match up against Valley Christian, Maddy Sevier defeated her singles opponent in straight sets 6-0, 6-0. Sevier then followed up the win with another, as she and Morgan Brooks defeated their doubles opponent 6-0, 6-1. Polson 5, Whitefish 2; Polson 5, Cut Bank 1: The Polson girls tennis team continued their dominance beating Whitefish 5-2 and Cut Bank 5-1 on Friday afternoon during the Cut Bank Invitational, which was moved to Polson due uncooperative weather in Cut Bank. Winning two matches apiece where Briana Forman and Shea McGuinness, who won two singles matches. Berkely Ellis, Josie Peterson and Ara Mercer each won one singles and one doubles match.